We can help you with your high-level checks. Breeze through your DBS Checks with our online system. If you are placing individuals in a position of trust with children and/or vulnerable adults, you may wish to obtain Enhanced level DBS checks (criminal record check). This level of check will allow an interested party (usually the employer) to request information relating to any previous spent and unspent convictions on the applicant’s criminal record. There are some further levels of check which allow additional types of information to be disclosed, such as information held on the DBS barred lists for work with Children and/or Vulnerable Adults. DDC can help you determine the right level of DBS check and guide you through the application process. The list of specific roles eligible for different levels of DBS checks is updated periodically. We recommend that you obtain the information from the dedicated pages on this website or directly from the DBS via our links page. You can also email the DBS directly to check for clarification or guidance. If you are not sure about the roles that employees are undertaking or the guidance from the DBS, you can contact us directly for assistance. It is important that you notify and ask employees to carry out their DBS checks at the correct point in any recruitment process, to ensure no employment laws are contravened. 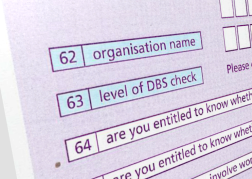 Why do I ask staff to carry out a DBS Check? Under the Rehabilitation of Offenders Act 1974, a person with a criminal record is not required to disclose any spent convictions unless the position they are applying for, or are currently undertaking, is listed as an exception under the Act. Before asking an individual to apply for a DBS Disclosure, you are legally obliged to ensure you are entitled to ask for a DBS Check. If the role being offered or currently undertaken is not eligible, the final option would be to request a Basic check. Standard level DBS checks can be obtained for positions included in the Rehabilitation of Offenders Act (ROA) 1974 (Exceptions) Order 1975. Enhanced level DBS checks can be obtained for positions included in the Rehabilitation of Offenders Act (ROA) 1974 (Exceptions) Order 1975 and in Police Act 1997 Regulations. The Protection of Freedoms Act 2012 created a new definition for ‘Regulated Activity’. Where Regulated Activity is being undertaken by the employee a check of the DBS Barred Lists for working with children and/or Vulnerable Adults can be requested. For more information about deciding the correct level/type of check to request please see our DBS Regulated Activity webpage.